Can You Buy Girl Scout Cookies Online? It’s that time of the year again when those in your office with girls in the Girl Scouts will be requesting you to buy their daughter’s Girl Scout Cookies. You can mark your calendar at that time of the year when Thin Mints, Tagalongs, and Do-Si-Dos come out in force. What Organization Does Buying Girl Scout Cookies Help? Sales of Girl Scout cookies reached a total of $800 million nationwide last year. It is expected that just as many will be sold this year. And, as the time passes, more variety is being offered. 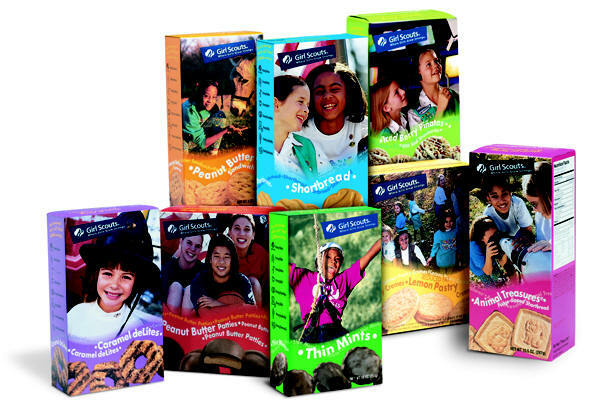 You can now find Girl Scout Cookie options to better fit your dietary needs. You will also be able to get last year’s favorite, The Smore cookie, as well. Why do the Girl Scouts sell cookies? And why should you never buy the cookies online? Why Do They Sell Cookies? Girl Scouts practice life skills like goal setting, money management, and teamwork–and they have fun! Customers get a great product and get to support girls in their own community. All of the proceeds support Girl Scouting in the local community. What Cause Does the Revenue From Girl Scout Cookies Help? Recruit and train volunteer leaders for each troop/group. Provide the financial assistance needed to make Girl Scouting available for all girls. Improve and maintain camp and other activity sites. Keep event/camp fees for all members to a minimum. Sponsor special events and projects. Yes. You can now buy Girl Scout cookies online. For a long time, the organization refrained from selling the goodies online in order to protect “the safety and security of the young sales representatives.” This meant that anything being sold online would have been sold through a third-party vendor. However, the Girl Scouts continues to change with new technology. Many local troops and individual families are now setting up small sites, and even Facebook pages, to sell Girl Scout cookies online this year. You can also buy Girl Scout cookies almost anywhere at this time of year. On the weekends, many of the troops will be set up outside grocery stores and other establishments to tempt you into buying their tasty treats. Most Girl Scout troops have the ability to now take credit and debit cards as well, thanks to modern technology. You can also pay in cash. If you have more questions about where you can buy Girl Scout cookies, or want more information about the Girl Scouts of America, you can visit the official website at girlscouts.org for more details about this 101-year tradition. Do they get a significant portion of the proceeds? I have always been told that they get very little. Maybe it would be better just to give them the 20.00 as a donation. Friend of mine is a girl scout leader. Her troop only gets $0.50 for every box. The boxes around here go for about $3.50. I would rather give them a donation too to help the troop more directly but I’m not sure the best way to go about it. THANK YOU, Valerie, for explaining to the public the official reason that GS cookies should not be sold or bought online and for discouraging the practice! Although the price per box and the amount the troops receive per box vary between councils, one thing is consistent: the amount per box that the bakery receives is about $.85. Last year in my council, about $.59 went to troops for patches, trips, and programming supplies, $.04 paid for the incentives for girls to sell more cookies, and $2.02 went to the council to provide programming for all girls “including camp expenses, council sponsored programs, free adult trainings, and administrative expenses.” I got this from my daughter’s order form (she’s a Brownie and I’m a Lifetime Member of GS with this being my 25th year). SO, please buy the cookies, but if you feel strongly about more of your money going to a local troop, speak with the leaders – you may find that they have a need you can help them meet through donation of items instead of money. My daughter’s troop (6th grade juniors) gets $.55/box. This year cookies jumped to $4 from $3/box. We’re going to have a hard time selling at the booth this year. I used to be a troop leader. DONATIONS ARE MUCH MORE APPRECIATED! If I remember correctly the $ limit was $25 before it had to be given to council. In my case, I always made sure it was below $25 because our council (won’t tell you where) is nasty and spends too much money on things the girls don’t need/want. Our troop learned a lot and had a lot of fun with the money we made which is what the girls are supposed to be doing — learning by having fun! If someone is selling a box online, they had to buy it from girl scouts, so they did earn revenue on it. How else would someone get girl scout cookies to sell? Out of each $4 box, our troop gets .67. We are lucky that many people hand us a donation outright, which all of it goes to our troop. Still, it’s our only official fundraiser, and we need what we get, so don’t stop buying. As a Girl Scout Leader of 11 years I had TONS of experience with the annual cookie sale. The MAJOR thing to know about the cookie sale is that it is designed as a COUNCIL FUNDRAISER, not a TROOP FUNDRAISER. Girl Scout Councils are HORRIBLY underfunded by “The Powers that Be” and the cookie sale is very necessary to support the programs that they provide. In our Council only the cost of the cookies left our coffers. Money went to the council, the service unit, and the troop. (See Necole’s post #3 above) While our portion of the “take” as a troop wasn’t that large, we were contributing to “the family” and ensuring that our program could continue. As we matured and our activities expenses as a troop skyrocketed we incorporated our own TROOP FUNDRAISERS where we kept ALL OF THE PROFITS. The girls learned LOTS about money management and costs of activities by learning through both the cookie sales and other fundraisers. Taking care of self AND others needs was one of the major lessons learned in my opinion. We ALWAYS appreciated donations, and those we got while selling cookies we split 50/50 with the council – and that was THE GIRLS DECISION! SO PLEASE KEEP BUYING THE COOKIES! It’s not the fault of the girls or their parents if the BIG PICTURE isn’t presented right by the Cookie Chair People….and if thier council isn’t managing the money well – get involved and MAKE CHANGES! opur boxes are still $3.50 with $0.50 to the troop this year. It seems like the troop doesn’t actually get much of the proceeds. You see that the boxes cost $3.50, but the troop only gets $.50. That’s true….. up front. However, as Necole also posted, the troops are still benefitted more than just that $.50. The leaders’ training is in that, the cost of awards and recognitions that the councils hand out is included, the years of service pins to volunteers is included, and the money pays for equipment and supplies directly related to Summer Camps as well as Financial Aid for those girls who may not be able to afford scouts otherwise. It really seems like the troop doesn’t get much at all for their hard work, until you factor those things in as well. I have been a troop leader for 12 years now and a service unit manager(still a volunteer position) for nearly 6 years. At first look it hardly seems fair or worth it, but it is. The girls benefit even more than the $3.50 per box in my opinion. I agree with Necole 100%. Please continue to buy the cookies from the girls. Just the sale is worth it to them. And, they really do learn alot from doing it. Really and truely, the girls would rather you buy cookies than give them a donation. It’s a really big deal to them when they make that sale. It truely is. Now it is 2011. Girl Scouts are allowed to sell online and most troops practice sellings and questions that might be asked!!! UNDERSTOOD? I am a girl scout and the price of cookies are 3.75 a box! NEVER buy them online if you do they could be delivered all crunched up and crumbs… ewwww! Girl Scouts like me do booth sales all over. Now different states sell different cookies from different bakers i’m in Virginia so the type of cookies are Thin Mints- chocolate (best-seller), Samoas(my favorite)-cocunut with chocolate (theres an icecream called Samoa Icecream), Thank-u-berry Munch- Cranberry cookie (delisous), Tagolongs- chocolate covered pattie with peanut butter in the middle (good when in the refrigarator), Dule-Se-Lache-caramel cookie , Lemon-Chale-Cremes- shortbread cookie with lemon filling (reminds me of an oreo), Trefoils-a shortbread cookie (best in icecream)and more! Finally the best way to eat a lot of cookies are to freeze them and buy a lot it helps us nation wide reaching our goal! I also recommend to try all of the some of them don’t looks very good… but when you try them they can be the most amazing taste!